The Mini Travelmate easily attaches to most toddler and convertible car seats quickly turning your car seat into an airport stroller, continuing to make traveling with your child and car seats a breeze. With the Mini Travelmate, Go-Go Babyz® brings you a simple, compact design that is fully assembled. Its well-thought design provides more safety and stability with the widest wheel base available, increased leverage and balance with wheel placement, and easy attachment with the ratcheting buckle system. The Mini Travelmate is a convenient and safe attachment for a variety of convertible/toddler car seats. Instead of carrying your car seat and child through an airport, they can now be wheeled through a crowd! The Mini Travelmate is easily mounted or removed and it allows one hand to be free. 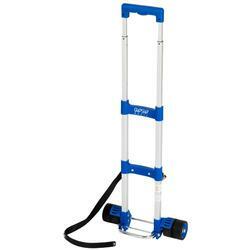 It features wide wheels and telescopic handle, and weighs in at just 3.5 lbs. Airports: Because the FAA strongly recommends children under 40 lbs. be seated in a child car seat on an airplane, parents have had to haul their car seats through the airport, straining their backs, arms and patience. The Mini Travelmate significantly lightens the load of parents on the go with toddlers and all their gear. A car seat using the gogo Kidz Travelmate eliminates the need to hand carry, rent or borrow a car seat at your final destination.
! WARNING! Do not leave the Mini Travelmate attached to the car seat while driving in an automobile. The Mini Travelmate has not been tested in combination with any car seats in any crash testing program and injury to your child could occur. For Babies and Children up to 44 lbs. Peg Perego Primo Viagio SIP conv.